6 months ago, I wrote this post, asking whether austerity measures can solve the deficit problem, and I thought it was time to have a look at what I said in that post, and what has happened since then. In the post, I argue that austerity measures prevent the economy from growing, or even cause it to go into recession, and that the lack of growth means that it will not be possible to remove the deficit, and trying to do so would not just fail, but hurt many people along the way. The economic data for the UK has not been encouraging. Unemployment has risen to 2.68 million people, with youth unemployment comfortably over 1 million. In addition to this, hundreds of thousands of people have taken part time jobs because they have been unable to find full time work. Recently, Jaguar had 20,000 applications for 1,000 positions, and a new hotel had 1,500 applications for 100 positions. GDP has not been good either, with the UK contracting by 0.2% in Q4 of 2011, and period that will have been boosted by Christmas sales. If, as is expected, we have a further contraction in the first quarter of 2012, then we will be officially back in recession – and since we never grew back to the point we were before 2008, this will be a “double-dip recession”. Looking to Europe we can see similar things happening. In Ireland, the deficit has actually grown, from €19bn to €25bn as austerity measures kill the economy. In Greece, austerity measures have also presided over a rising deficit, with a 15% increase from Sept. 2010 to Sept. 2011. (This has since been reduced by writing off large amounts of debt). Across southern Europe, we see rising unemployment, and especially youth unemployment. Spain now has a staggering 50% of 16-24 year olds out of work, with Portugal, Italy and Greece not far behind. Indeed only 3 EU countries (Germany, Austria and Netherlands) have youth unemployment rates under 10%. 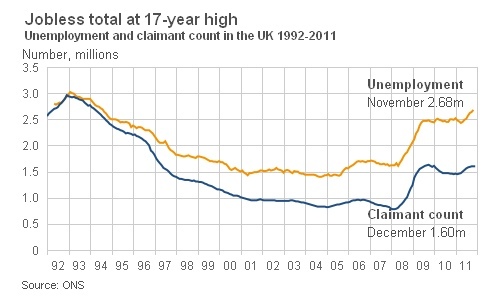 In November, the UK had a youth unemployment rate of 20.4%, and youth unemployment has risen since then. Additionally, around 1/3rd of people in Birmingham are under 25 – we are the youngest city in the UK – which means that we are feeling the impact of youth unemployment more heavily than elsewhere. So unemployment is up, growth is down and inflation is still hovering around 4%-5% (whilst average wages increased at only 1.9% in 2011 – a real terms pay cut for most of us.. not so for the FTSE 100 directors who saw a pay increase of 49%). All of this is bad of course, and no politician will deny that. But, they say, it is the price we have to pay to clear our deficit. We must get through this pain, all in it together (except, of course, the wealthiest people who are seeing their wealth increase at staggering rates). So what has happened to our deficit? We have seen that Ireland and Greece have increased their deficit whilst taking austerity measures, how is the UK doing? In August 2011, we set a record for the biggest August deficit on record, and across the year things are not much better. We have managed to reduce our deficit, but according to the Autumn Statement (PDF – table on p81) we were on course to reduce our deficit by just £4.7bn in 2011. This is in contrast to the claims of reducing the deficit by £20bn each year made in 2010, when the coalition set out their cuts agenda. With the economy shrinking in the final quarter of 2011, it seems likely that the forecast done for the budget statement will prove to be wrong, and unless the economy picks up in 2012, we are likely to see an even smaller reduction, or even a growing deficit as in Ireland and Greece, despite huge cuts in spending. Update, May 3rd 2012: The CBI have predicted that the budget deficit for 2012-13 will be around £128bn – £8bn more than the £120bn George Osborne claimed in the budget, and £2bn more than the £126bn deficit for 2011-12. If this prediction is right, then austerity will have increased the deficit. As explained in the earlier post, cutting spending at a time when the economy is not doing well only serves to reduce demand in the economy, putting people out of work which in turn causes tax receipts to fall and government spending to rise. Indeed, every 100,000 people who become unemployed costs the government £500 million. To reduce the deficit we need an alternative to austerity. We need to invest in our economy to create jobs and growth, and we can do this in ways that provide other bonuses, such as investing in new, environmentally efficient social housing, that will both act to reduce the housing benefit bill by bringing rental costs down and also provide high quality affordable housing that is suitable for a sustainable future. There are many ways in which we could invest in our economy, some of which are outlined in this post about keynesian stimulus. Future posts will explore the possibility of a “Green New Deal” and of other infrastructure projects. Other alternatives to austerity can be found in our alternatives series, or on the False Economy website. This post is another in our series exploring the alternatives to the cuts and austerity agenda of the ConDem coalition. In this post I will look at the tax gap, which costs the treasury an estimated £120bn every year, and what we can do to close this gap. My expert witness for this is Richard Murphy of Tax Research UK. His Tax Justice Manifesto (PDF) outlines the scale of the problem and some ways in which this problem could be dealt with. The tax gap comprises of three parts – tax avoidance (£25bn), tax evasion (£70bn) and uncollected tax (£25bn). Tax avoidance is legal. It is defined as a scheme that has been setup purely for the purposes of shifting profit from one country to another, in order to pay lower rates of tax. Tax evasion is illegal. This includes tax fraud, undeclared earnings and the purchase of smuggled tobacco or alcohol amongst other things. Uncollected Tax is tax that has not been collected due to error or inefficiency on the part of HMRC. Of the three, it is tax avoidance that has come under the most scrutiny, thanks to the actions of UK Uncut, who have taken direct action by occupying high street stores around the UK to highlight the tax dodging of multinational corporations and wealthy individuals such as Vodafone and Philip Green. Vodafone’s tax avoidance scheme is simple. When Vodafone UK purchased Mannesman (a German mobile network), it did so through a Luxembourg subsidiary. The effect of this is that profit that should be declared in the UK is in fact declared in Luxembourg. HMRC said that this was not a legal scheme, but instead of pursuing Vodafone for the full amount (£6bn according to Private Eye), they settled for just £1.2bn, thus allowing Vodafone to cheat nearly £5bn out of the UK taxpayer (the scheme ran for around 8 years). Philip Green is one of the richest men in Britain. He runs the Arcadia group which owns high street names including Topshop/Topman, BHS, Dorothy Perkins, Miss Selfridge and Burtons. In 2005, having transferred ownership of the company to his wife, who lives in Monaco, Philip generously paid her a £1.2bn dividend, thus avoiding paying £285m in income tax. Mrs Green has never done a minutes work for the company that Philip runs. Had this been a small company, HMRC would look at prosecutions for revenue splitting, but not in this case.Just to make it clear what this means, Birmingham City Council is cutting £212m from its budget this year, at the cost of around 7,000 jobs, pay cuts for tens of thousands of workers and the closure of many services which support vulnerable people in this city. In just one year, Philip Green avoided more than that. Had he paid the tax, he would still have earnt around £900,000,000 that year. Overall the level of tax avoidance, at around £25bn, could replace a years worth of cuts. In practice of course it would not be possible to get all of this money back (not least because you’d have to spend some money with HMRC to do so), but we could look at a net increase in income of at least £10bn if we genuinely sought to close the tax loopholes that allow this avoidance to occur. Combined with increased money to tackle tax evasion, and to eliminate errors to reclaim that £25bn of tax that goes uncollected each year, we could seriously reduce the need for cuts to our services. The impact on the economy of effective tax rises would be less than that of spending cuts, and those people who rely on services would not see them disappear. So, what is our government doing? They are cutting HMRCs budget. So much for that then. You can find out more about the alternatives to the cuts by looking through our posts on the subject, or on the False Economy website. This post forms part of the alternatives to cuts series, an exploration into why cuts won’t work, and what we could be doing instead. As I wrote in the Will Austerity Solve the Deficit Problem? post, there is a clear relationship between the size of the deficit, and periods of growth/recession. During periods of growth the deficit shrinks, and if the problem you are seeking to solve is the size of the deficit, then one thing you want to do is ensure that there is growth in the economy. In that post I showed that austerity is not producing growth now, rather the economy has flatlined., and that this will fundamentally undermine the spending cuts in their effect on the deficit. In this post I am not going to explore deeply the theory behind why governments borrowing and spending money produces growth, if people want it, I will try to write a post on that. The basic idea is that recessions happen because of a lack of demand. People stop spending money, and so the level of production/trade in the country decreases to match this new level of spending. Unfortunately, there is a vicious circle effect, because as people lose their jobs, their spending (demand) decreases, causing further reduction in the level of aggregate demand, which in turn causes reduction in the level of production/trade and so on. Governments have the ability to step in and produce demand during these periods, and to turn the vicious circle into a virtuous circle of rising demand and employment. There are a number of ways they can do this, and Quantitative Easing was one of them. But this produced jobless growth, as it reduced the level of debt (or at least the level of risk associated with the debt) of the private sector, allowing some growth in value of the economy, without a commensurate increase in employment. Now is the time where a government should be spending money to invest in the economy, in order to stimulate demand and in turn stimulate the private sector back into growth. There are many proposals as to how this money should be spent, and I will outline some of them here. The best way to spend money for a Keynesian stimulus is by investing in infrastructure, or in areas which are either too risky, or have a rate of return that is too long for private companies to invest in. If these investments can also help to forward other policy aims, then so much the better. Please note that the inclusion of a possible policy here does not constitute a statement of support for that policy by Birmingham Against the Cuts. There are other discussions to be had about the merits of each of them, which I am not going to enter here. Variously called by different titles, this set of investment would see government funds invested in the manufacturing sector surrounding “green” industries. The most likely place for much of this money to go would be into the design and manufacture of wind turbines – particularly offshore wind turbines- tidal and wave generators. The UK has some of the best resources for renewable energy in each of these areas, and could be world leaders in these technologies. Investing in these could replace some of the industries that have been largely lost, such as shipbuilding or steel production. Additionally, it would make sense that the UK would start as the major customer of the industry in this country, and doing so would help us to reduce our reliance on fossil fuels and combat climate change. Along with this, we need to reduce our dependency on oil and gas, and become (more) self-sustained in terms of energy usage. I will do a lengthier post on this at some point. This is particularly controversial at the moment, and I must emphasise that its inclusion here does not imply support or dislike for the project. I am including it here because it is a good example of an investment whose returns will take too long for a private company to invest. There is never likely to be the profit in a short enough space of time for a company to invest in such a project, which will take many years to construct, and many more before a return on investment is possible (if ever, given the amount of subsidies that are paid to railways already). The great council house sell-off, and the ban on councils investing in new housing is part of the reason why house prices are so high today (there are other factors, but the lack of a widescale, reasonably priced, rental market has allowed rent and house prices to rise). We hear often of issues with affordable housing, particularly in London, or with a lack of housing. These houses could be built to the highest environmental standards, and would be very cheap to heat during the winter. With ever rising gas prices, this could be especially helpful for elderly people. Additionally, the construction industry is always hit hard by a recession, and this would help that sector in particular. Schools, Hospitals and many other public buildings could use renovating or replacing. Such projects should not be done using PFI, which has been shown to be expensive, but would improve public services, through a one-off payment. There are many other ways to produce a Keynesian stimulus. The key is that increased government spending produces demand, and that it is easy for that spending to be removed once the need for the stimulus is over. The unemployment benefit system is an example of an existing keynesian stimulus, which works almost naturally – as we enter recession, more people become unemployed, and government spending on unemployment benefits increases. As the private sector moves back to growth, people get jobs and spending on unemployment benefits decreases. But this is not enough – it is already existing in the system, it limits the depth of a recession but will not take us out of one. Join us in calling for an alternative to austerity, on Sunday 18th September, outside the Liberal Democrat Conference in Birmingham. Over 500 charities across the Midlands are facing budget cuts as local authorities reduce their funding – or in some cases completely withdraw it – according to new research published today (Tuesday) by the union backed anti-cuts campaign website False Economy. The research, based on Freedom of Information responses from local councils across the region, shows that one year on from the launch of the Big Society, many charities and voluntary groups are facing deep funding cuts. Birmingham City Council has cut funding to 191 charities – the largest number in the country. In March, the ConDem coalition voted to cut £212million from the budget for 2011/12, and these cuts have fallen on charities and advisory organisations as well as council services. All charities or voluntary groups receiving a funding cut of at least five per cent are listed in the research, although most of the cuts are far deeper than this and many groups have had their funding cancelled completely. These deep cuts to voluntary groups across the Midlands show that government claims that charities can replace direct services currently provided by central or local government are false. It sounds great, but in practice, the Big Society is looking more and more like a big con. These cuts go deep into the voluntary and community sectors. These are not just ‘nice to have’ groups but organisations providing vital services for older people trying to maintain independent lives, vulnerable children and abused women. And with so many of the cuts simply resulting in further pressure on the NHS or other statutory services, they are truly a false economy. “Ministers talk up localism and say services will be better shaped locally, but the huge front-loaded cuts to councils mean that local decision-making simply gives councils the choice of which vulnerable people they should make suffer for an economic crisis they did nothing to cause. I will be taking a close look at the data to find out what is happenng in Birmingham, so that we can organise and fight against these cuts. We can have successes – advisory organisations took the council to court recently, and won a judgement that restored their funding temporarily, as the council had not consulted properly. A campaign involving Stirchley and Cotteridge against the Cuts saw interim funding being granted to the Cotteridge Day Centre. These are only temporary victories, but they delay the effect of cuts and give us further time to stop them entirely. Labour councillors voted against the cuts, along with Respect, and in 2012, Labour may gain control of the council again. Perhaps if they do, they will follow through their vote against the budget and restore funding to these groups under threat. If you are being affected by one of these cuts, please let us know – comment here or add a testimony to the False Economy website. If you want to fight these cuts, we want to help you. Come along to our next planning meeting on 22nd August, or email us at BirminghamAgainstTheCuts@gmail.com to get more involved. Save the Derby Railways .. an alternative to cuts? March from Bass Recreation Ground (off St Alkmund’s Way A601) 10am July 23rd to a rally at The Silk Mill. As you probably know, the government has awarded the £1.4 billion contract for Thameslink rolling stock to Siemens in Germany rather than to Bombardier (the privatised British Rail engineering). 1400 jobs in Derby are planned to go – with a “knock on” effect on 13000 more jobs in the Midlands. We can and will win this one – given speedy organisation and determination! This event isn’t in Birmingham, and I don’t often mention things outside of Birmingham but apart from the desire to express solidarity with people losing their jobs in and around Derby, it serves to illustrate some of the things that I have an will be talking about in the alternatives to cuts series. That is the relationship between investment, jobs and growth and what that relationship means to the economy and importantly to the deficit and debt. There’s an interesting blog post on this relationship (albeit focused on the USA for it’s data, but the theory holds in the UK as well, and I’d expect to see similar shaped graphs over here. It does get a bit technical later on but stick with it). Billy Mitchell is Research Professor in Economics and Director of the Centre of Full Employment and Equity (CofFEE), at the University of Newcastle, NSW Australia. It is clear that a solution to unemployment is to stimulate private spending. The problem is that the neo-liberal period has pushed so much debt onto the private sector that the balance sheet adjustments necessary to reduce the debt exposure will take time. Holding out for a sudden reversal of the investment ratio is poor policy and just forces unemployment to remain higher for longer. The correct thing to do – despite what Paul Ryan thinks – is for the government to expand its share of total spending even further and drive aggregate demand harder at present. It should start by introducing a Job Guarantee and spending on public infrastructure. There is no secret – unemployment is caused by a failure of aggregate demand. When one or more components fail (private spending) then public spending has to fill the gap. I am sorry it is so simple. Unfortunately in Derby we see the reverse of this happening. This is not strictly a cut, as far as I understand it, because it is a new contract, but it has the same effect as a cut – job losses – and runs directly against one of the alternatives to the cuts – policies to produce economic growth (I’m clearly going to have to write that post soon because this is the second time I’ve needed to link to it!). This government could have decided that investing in manufacturing in the UK provided the best value for money for taxpayers, but they chose to take the cheapest option instead, an option that is going to cost Derby hugely – and in Birmingham we know what it is like to lose a large manufacturer. This decision shows how far removed the ConDems are from the ideas that surround policies for economic growth – policies that would themselves produce a situation which reduce the deficit and the debt. If the government had chosen to invest in UK manufacturing we would see people in jobs, paying taxes, earning and spending money and being productive. Instead we see people signing-on, hoping to find a new job at an economically uncertain time (although jobless totals fell last month (link to pdf)). This will cost the government, not just through the lost taxes both from the workers and the company, but also in increased welfare & benefit payments. And you can see the initial knock on effect from 1,400 job losses – an expected 13,000 jobs affected. Any of those jobs lost will also have a knock on effect (albeit much smaller). Job losses cause job losses, and as an economic climate becomes more uncertain, private companies become less willing to take risks (especially when it’s hard to borrow money). If private companies do not take risks to expand their business, then they will not make up for the jobs being lost in the public sector. What needs to happen is that the public sector needs to step in, the government can borrow money (despite what you hear from right wingers – I’ll explore that in another post to come in the alternatives series), and it can borrow money more cheaply than the private sector. By investing in manufacturing and infrastructure, the government can tackle many issues at once – creating jobs and growth; supporting the UK manufacturing industry and by investing in “green manufacturing” we can help to work on the much longer term problems of our energy requirements and climate change. Unfortunately such joined up thinking does not seem to come from this government. So if you can go along to Derby to support their workers then do so, not just because you want to show your solidarity, but also because investing in the manufacturing sector is exactly the kind of thing this government should be doing as part of its economic policy set, but isn’t, and that failure is likely to put us into a double-dip recession. Alternatives to the Cuts: Will Austerity Solve the Deficit Problem? This post is going to explore what effect the austerity agenda being pursued by the government is likely to have on the levels of deficit and debt for the UK government. This is part of the alternatives to the cuts series, which will seek to explore and explain why the cuts won’t work, and what the alternatives are. You can see an archive of posts in the series here. The problem, so we are told, is that the government is spending too much money. We are borrowing in an unsustainable fashion and our deficit – the amount of money we need to borrow each month or year – is spiralling out of control. This means that our national debt – the amount of money that we owe in total – is rising to a point where we might face a sovereign debt crisis. I’m going to explore how true that is in another post, but for now let us accept that this is more or less true. Let us say that we do need to reduce the deficit, and in a serious manner, in order to avoid the problems that we can see happening in Greece, Portugal, Spain, Italy and Ireland whose credit ratings are being downgraded, and their governments are being forced to borrow even more money – or possibly default on debts. The question we must ask is will cutting spending solve this problem, and in this post I am going to outline some of the reasons why it won’t. Don’t just take my word for it, have a look at what some of the experts have to say. This graph shows the level of debt as a % of GDP (the inset shows from the start of the 20th century). You can see that right up until the point that Northern Rock collapsed, the debt was at a lower level than for much of the time under Thatcher. This graph shows changes in the deficit level. 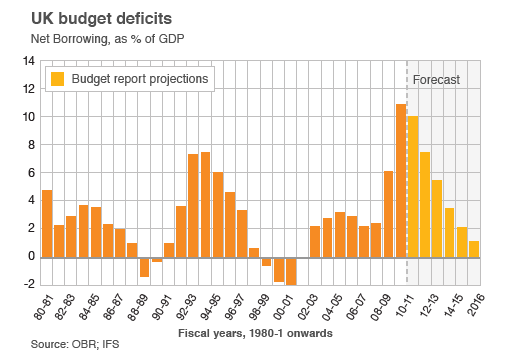 One thing that is clear from this is that recessions (ie: the recession in the early 1990s) increase the size of the deficit, whilst in periods of growth (such as the late 80s, or late 90s/early 00s) act to reduce the deficit. So we can say that if we want to reduce the deficit, the last thing we want is a recession – or at least, a recession would be unhelpful in our pursuit of deficit reduction. Conversely we can say that strong growth – in particular the kind of growth which comes from increases in employment – would be helpful. So what’s been happening to GDP recently? This graph shows changes in GDP – the bars are for that quarter, whilst the line shows an average of the previous year. You can see the recession following the banking collapse with a fall of nearly 6% in GDP between 2008 & 2009. Then there is a recovery, towards the end of 2009. It should be noted however that this growth did not produce a significant fall in unemployment nationally (although interestingly, and something I didn’t know until I saw that graph, the West Midlands did see a fall in unemployment in that period). Then something happens around Q2 of 2010.. sometime between March and April the GDP growth peaks (can you think of any significant event happening between March and April 2010? ), and although there is GDP growth in Q3 2010, it is less than the previous quarter. OK, seasonal variation, nothing significant it just happens to be less.. but then in Q4 2010, there is actual shrinking of the economy of -0.5%. Osborne blamed the snow, but the following quarter saw growth of just 0.5%, which means that the bounceback effect of deferred spending from the previous quarter was not enough to produce growth over the 6 months following the budget review which revealed the true scale of cuts that the ConDems are planning. Technically not a recession, as that requires two consecutive quarters of contraction in the economy, rather than an average over 6 months. The next quarter’s initial figures will be out in the next week or so, but indications put it at 0% to 0.3%, hardly the kind of levels of growth required to put the economy back on track, and produce the growth and jobs that would provide an increase in taxation revenues, and a reduction in benefit payments for the government, and which would naturally reduce the level of deficit until – just like after the recession in the 90s – we reach a point where we are running at a surplus and paying off that debt. At some point I’ll write a post that explores more theoretically why cutting spending at this point in the economic cycle, and in the circumstances the world, and particularly some of our close neighbours, find themselves in will not produce growth, as Paul Krugmann (Nobel Prize winner for Economics, 2008) argues. I will highly recommend Krugmann’s blog – although focussed on the USA, he provides an important source of information – sometimes his posts are very technical, but often they are highly accessible and useful in giving yourself the information you need to win arguments about spending cuts. So we can see that the economy has gone from moderate growth to flatlining between Q4 2010 and (presumably) Q2 2011 – in the 9 months since the ConDems budget review revealed the scale of cuts to come. In that time we have also had a rise in VAT, and council budgets around the country revealing the job losses and pay cuts to come in local government. People around the UK are very aware that if they, or someone they know, works in the public sector they might well lose their job, or face a pay cut. Because of this, we have cut back our spending. This decreases demand, and in doing so puts the private sector at risk. Recently we have seen a slew of high street names entering administration, and construction industry growth slowing as well – often an early indicator of trouble to come. So far from growing to fill the space that the public sector has left (the idea being that the public sector is “crowding out” the private sector), the private sector may well shrink as well. This could lead to another recession (the “double-dip recession”), and another recession will mean that the deficit will rise as tax income falls and welfare payments rise. Whether spending cuts can keep pace with those factors is not the question, the question is whether there is a solution (or group of solutions) that can reduce the deficit without producing recession – these are the alternatives to cuts, and I will be producing posts detailing each of them. This strand of discussion also links heavily to one of the alternatives that will be discussed in a future post – policies for growth. The rallying cry of the ConDems and their supporters. No alternative to huge cuts in public spending in order to deal with the deficit that Labour left us, and the national debt, which is unsustainably large. If we don’t make cuts then the debt will destroy our ability to spend any money at all as interest payments eat up available money. Sometimes people talk about not wanting to pass the burden of debt onto their children.. some talk about how if a household was in debt and spending more than they earnt you’d have to cut spending and think this analogy can be simply placed onto a national economy (which it can’t – but taking that analogy apart will wait for another post). The truth is that there are alternatives to cuts, and in fact the austerity measures being brought in are just as likely to ruin our economy and in fact end up increasing the deficit as they are to reduce them. This is the first in an occasional series of posts outlining the reasons why austerity won’t work, and what the alternatives are to them. More experts speaking against austerity can be found on the False Economy website. Whenever people tell you austerity is the answer to the problem, send them to read what these experts have to say. Ask them to find examples of austerity actually working (they’ll come back with Canada in the ’90s – briefly, Canada did reduce its national debt, but its economy flatlined during a period of explosive growth around the world, especially in its main trading partner (USA) and lots of extra revenue came in from new oil finds.. a post with more detail might come on this later.. essentially austerity produced a flat economy at a time when it should have been growing, and that growth would have reduced the national debt anyway). But it’s not enough to present people with an argument that says austerity probably won’t work if you can’t also provide a different solution. Thankfully there are other solutions to the issue of our deficit. Detail on the variety of ways in which we can proceed to provide a total solution are on the False Economy website. These include policies for economic growth (especially investment in green manufacturing); closing the £120bn tax gap; a robin hood tax on the banks that caused the crisis and taxing the rich. The most important of these is investing in the economy, producing jobs and growth to stimulate demand – demand which then helps the private sector to grow. At this point in time, the contractionary policies of the government are, surprisingly, causing the economy to contract. People are losing jobs or having pay cuts – or are concerned, quite rightly, that they will be losing their jobs or pay in the near future. Because of that they are not spending money, and because they are not spending money we are seeing the private sector get into trouble – high street shops are closing putting 10,000 jobs at risk; the construction industry shrank by over 3% in the first quarter (Q1) of 2011 and the early indicators for growth in Q2 2011 are that it will be between 0% and 0.3%.